If you’re like me and you’ve been pour painting for a while, you probably have quite a few paintings stored away, or maybe hanging on your walls. Or, let’s face it, stacked all over the house until you’ve taken over every room but the bathroom! 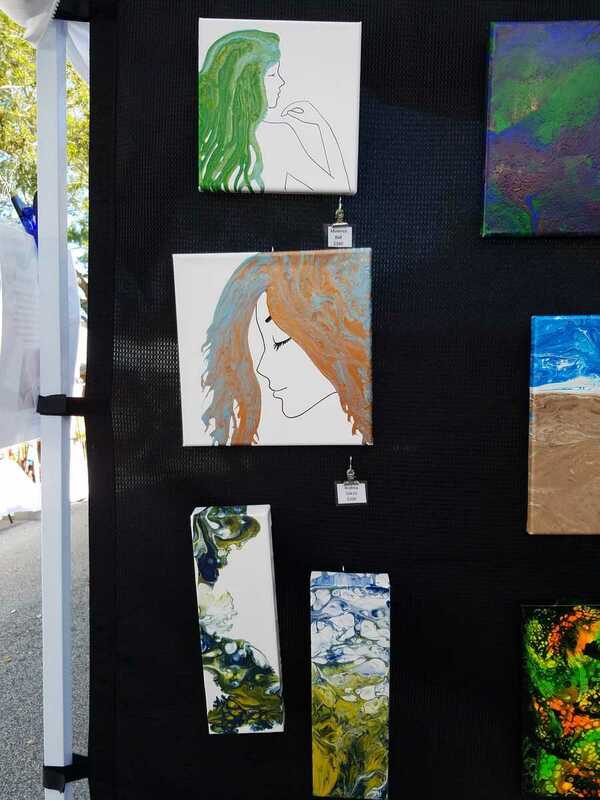 So now you may be thinking it’s time to take advantage of the art festival circuit and try and sell some of your pieces. I have been an artist and crafter since I was a child. My mother was a nationally renowned lettering artist who also painted and did botanical illustration. I was lucky to grow up with a fully stocked art studio in my house, a patient mother who was more than happy to teach me, and some innate creativity. My mother always had at least one piece in a show or gallery somewhere, but she rarely participated in art festivals. 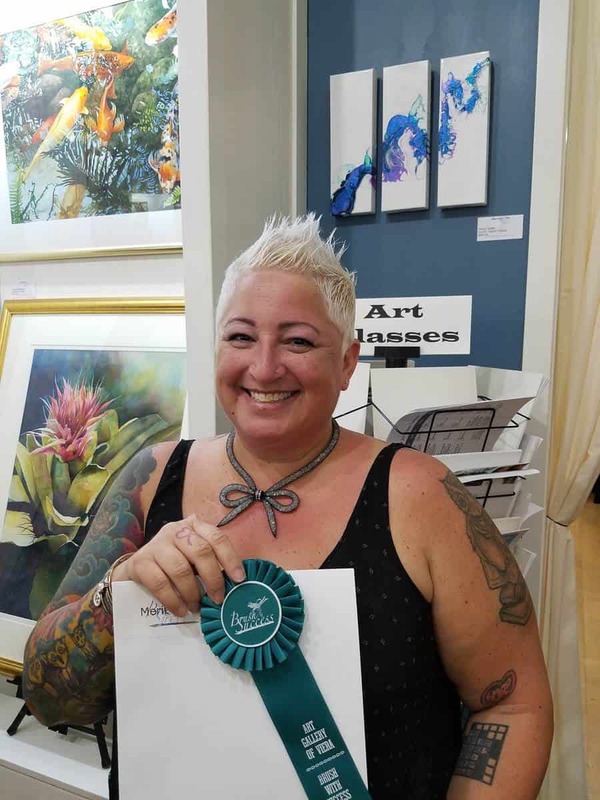 Once I honed my skill as a crafter and set up a successful Etsy shop, I started participating in craft festivals in Brevard County, Florida, where I live. 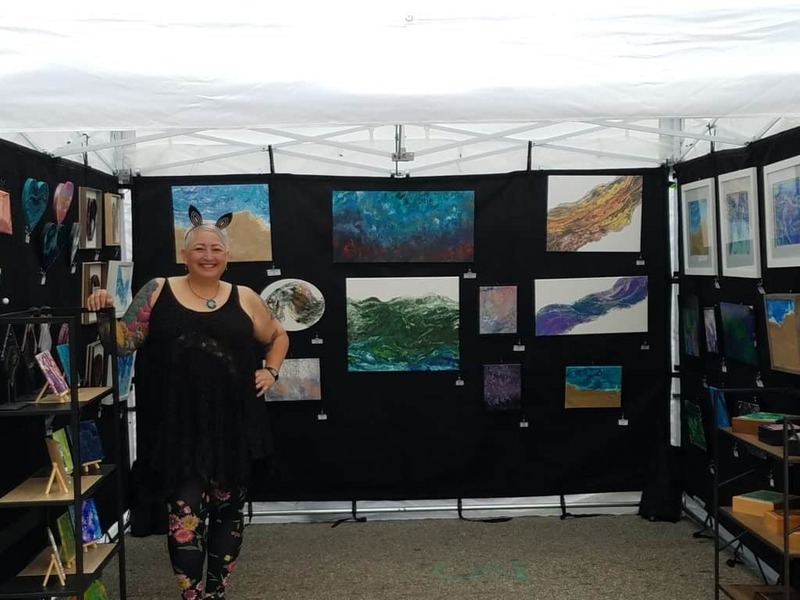 Craft fairs and festivals are very different from fine art festivals, and I have learned how to be successful at both. If possible, an artist should take advantage of the opportunity to show their work at art events. In addition to selling their pieces, artists can learn what the art buying public thinks about their work. There are challenges to success at art festivals, but those challenges can be overcome if you do your research and know your market. First things first, visit some art shows and festivals in your area. Observe everything and take notes about the quality of the art, number of booths, number of shoppers, types of displays and tents, etc. However, don’t photograph the displays or the art without the artist’s permission. As a matter of fact, most artists don’t allow photographs of their work. Talk to the artists and ask them for feedback about the show and how the experience was for them. But please don’t take up a lot of their time, especially if there are patrons in their booth. 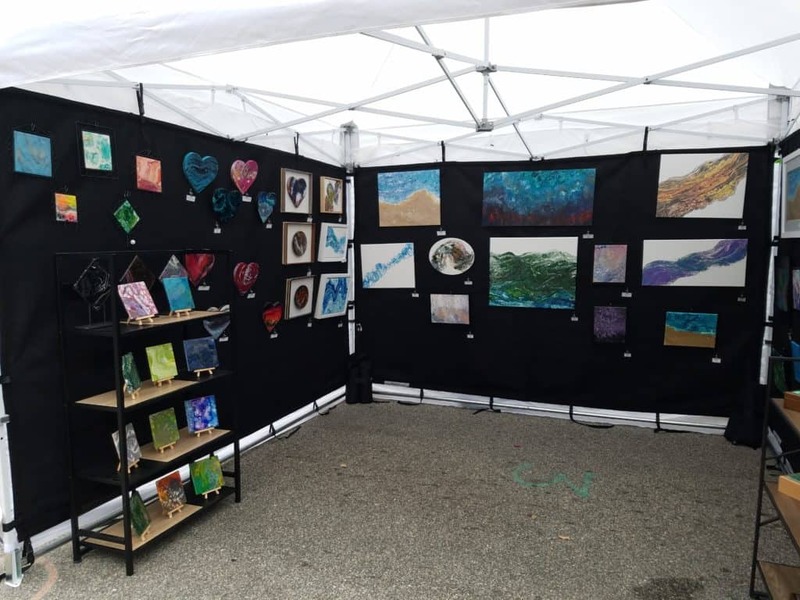 We artists are at the show to make sales, and you don’t want an artist to lose a potential customer because she was talking to you about her booth set-up. It’s important to become familiar with the art market in your area and the market of a particular show. That’s where visiting different shows will really make a big difference. This also helps with pricing your pieces. You want to gauge the price range of art at a show. Arts and crafts show clientele are usually not there to buy fine art, and if they are, they typically aren’t buying art at a higher price point. When I do arts and crafts shows, I usually don’t even bring my larger pieces, as I know they won’t sell. Fine arts festivals usually draw crowds of “art people” who celebrate the arts and are more apt to buy a statement piece of art. How you present yourself and your display is more important than you would think. You want your booth to look like a mini art gallery. Most fine arts festivals have rules in regards to tent color, size, display racks, etc. As tempting as it is, don’t bring everything you’ve ever painted! You want your booth space to be inviting and eye-catching, but not so overcrowded with art that it’s overwhelming. Choose your attire wisely; you don’t want to seem unapproachable, but you also don’t want to look too casual. If you’ve done your homework and visited your local shows, you should know what to wear. Be present, interact with people, look and sound professional. This includes your neighbor artists, as they are the ones who will keep an eye on your booth for your meal and restroom breaks. Some shows have booth sitters, but they are not always available. If you do the same shows every year, try to book the same space. Repeat customers are the best, and you want to make sure they know where to find you. In addition, if you know your show schedule for the year, you should have it available for patrons. Make sure you have plenty of business cards on hand. I also hand out refrigerator magnets with my logo and website, as people tend to lose business cards when they get home and unload their goodies from the show. I like to use a packing checklist and an inventory list with thumbnail photos of my art. I also keep my “tailgate kit” handy, in case I forget anything. My tailgate kit is exactly what it sounds like: the things I use for tailgating, which is similar to what I need for art show set-ups. It’s a small tackle box, and it contains bungee cords of varying sizes, magnets, rope, scissors, a box cutter, screwdrivers, packing tape, “S” hooks, Sharpie markers, wet wipes, and sunscreen. It’s important to have the ability to accept credit and debit cards. I use Square, but I’m sure there are other mobile card processing applications. Most people don’t carry too much cash, and you can lose sales if you can’t accept cards. However, you do want to make sure you have some cash on hand, in case you need to make change in a cash sale. I don’t accept checks, and I would advise you not to, either, but that is a personal preference. If you trust the check will clear, feel free to allow payment by check. Before you apply to fine art festivals, you will need high-quality photographs of your art and your booth set-up. All festivals I have applied to have required a booth shot. I cannot stress how important it is to have a professional looking booth. Your booth should be set up like a mini art gallery and your name should not be visible on your display. Of course, at the show you want a banner with your name and/or logo, but not for applications. All display racks should be covered, no metal showing and tents should be white. Early on I made the mistake of entering shows using grid walls for displays, and I wasn’t getting invited. I finally asked for feedback and was told that my art was beautiful but my booth shot was awful. I learned what to do, and I am always improving my display. I bought a soft wall system from Flourish, and I have added a rug and some personal touches. Since the jurors are deciding who to invite based strictly on photos, it is a good idea to invest in a photographer if you can’t take high-quality photos yourself. Practice setting up in your backyard and shoot the photos there. It’s always a good idea to do a test run and time yourself setting up so you are prepared on show day. Almost all art shows use an online application process and a majority use Zapp. It’s a good idea to set up a portfolio on Zapp with high-quality photos, so you’re ready to apply when the time comes. Be prepared for the cost of the festival circuit. Yes, you can make a lot of sales, but it costs money to make money. Most shows have a non-refundable application fee, usually around $25. Once you’re accepted to a show booth, fees typically range from $175 to $500 for a 10-by-10-foot space. 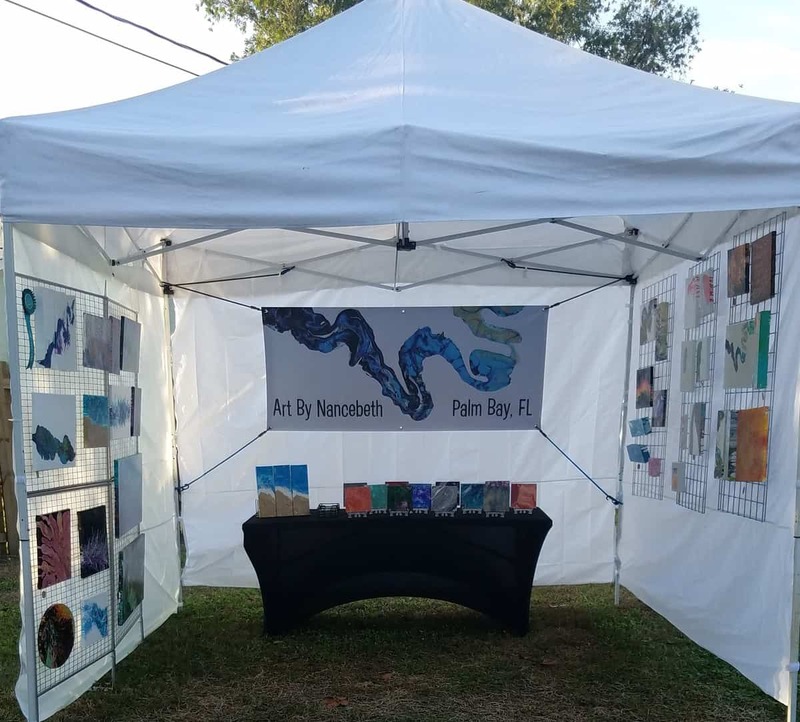 After you’ve factored in the cost of your display materials, booth equipment, entry fees, and travel expenses, art festivals are an expensive endeavor. But it’s an endeavor that can bring in a lot of sales and potential customers. I have done shows where I have made a huge profit, and I have done shows where I barely break even, but I have gained a nice following of people who like my art. I have gotten some commission work and I have met a lot of wonderful people. Art shows and festivals aren’t for everyone, but if you think you want to give it a try, go for it! If you follow my tricks and tips and do your research, art shows can be really fun and profitable. 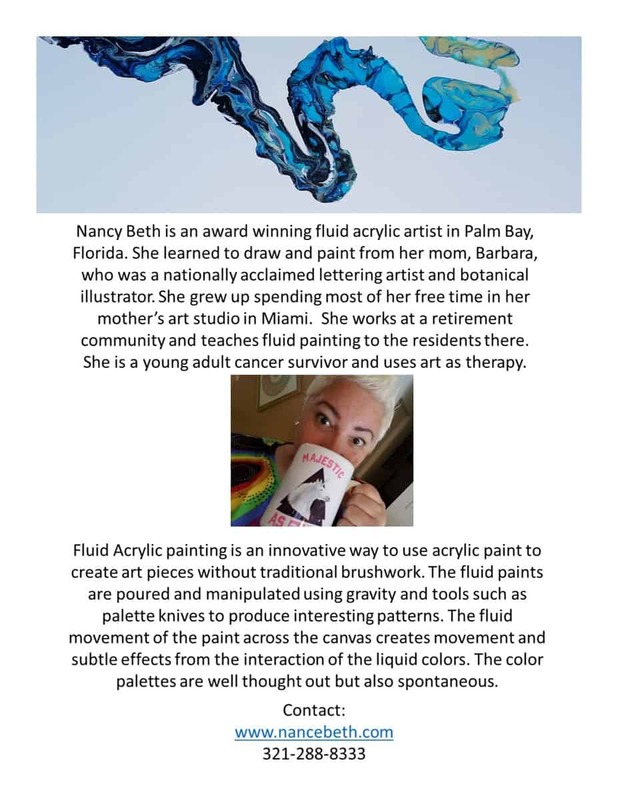 Nancy Beth is an award-winning fluid acrylic artist in Palm Bay, Florida. She learned to draw and paint from her mom, Barbara, who was a nationally acclaimed lettering artist and botanical illustrator. She grew up spending most of her free time in her mother’s art studio in Miami. She works at a retirement community and teaches fluid painting to the residents there. She is a young adult cancer survivor and uses art as therapy. Please visit her website at www.nancebeth.com. Muchas gracias Nancy por este artículo. Despejas cualquier duda a aquellos que queremos mostrar nuestro trabajo y todavía dudamos en hacerlo. Empecé hace poco con la pintura y me gustaría llevar mis cuadros de acrílicos fluidos a un Festival de Artesanía. Tus consejos me han sido muy útiles.